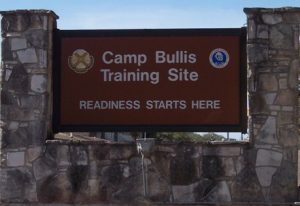 Established in 1917, Camp Bullis was originally used as one of many training sites for the American Expeditionary Force soon to be sent to Europe. Used as a small arms and rifle range for Fort Sam Houston, no units were stationed at the Camp. After World War I, the Camp served as a training site for various civilian and military organizations, including the Civilian Military Training Corps, the Civilian Conservation Corps (CCC), the Reserve Officer Training Corps (ROTC) and the Officer Reserve Corps. During World War II, the 2nd, 95th, and 88th Infantry Divisions used Camp Bullis. After the war, 500,000 soldiers were processed out through the separation center at the Camp. In 1977, the Air Force established the Air Force Security Police (Air Force Security Forces) Training Site at Camp Bullis. The Air Force was subsequently the single largest user of the camp until 1987. Health-care specialists training in the US Army, otherwise known as medics, travel from Fort Sam Houston to Camp Bullis to complete a two week field training exercise at the end of their advanced individual training. During the two weeks, they learn much about a medic's role in infantry affairs. The first day they are issued M16A2s, and are introduced to chemical warfare. During the next eight days they spend a day and a half on various infantry tactics and the medic's role in such. During the last five days they put into practice everything they have learned. The most sleep the medics get through all their training is in the field- about eight hours of night, in addition to daily showers and hot chow in the morning and evenings, accompanied with MREs for lunch.